↑ "Rules for the Fields Medal" (PDF). mathunion.org. ↑ On 1 April 2014 at 15:32 UTC, 8,000,000 Swedish kronor was worth $1,360,970 Canadian according to the OANDA currency converter. ↑ "The Nobel Prize Amounts". Nobelprize.org. Nobel Foundation. अभिगमन तिथि 13 August 2014. McKinnon Riehm, Elaine; Hoffman, Frances (2011). Turbulent Times in Mathematics: The Life of J.C. Fields and the History of the Fields Medal. Providence, RI: American Mathematical Society. आई॰ऍस॰बी॰ऍन॰ 0-8218-6914-0. Monastyrsky, Michael (1998). Modern Mathematics in the Light of the Fields Medal. Wellesley, MA: A. K. Peters. आई॰ऍस॰बी॰ऍन॰ 1-56881-083-0. Tropp, Henry S. (1976). 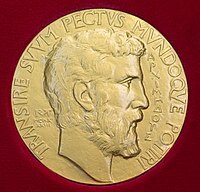 "The Origins and History of the Fields Medal". Historia Mathematica. 3 (2): 167–181. डीओआइ:10.1016/0315-0860(76)90033-1. .